In ordinary cultivation, propagation is accomplished by planting the tuber or a section of the tuber containing an eye, which is an undeveloped bud. New varieties are developed from seed produced after controlled pollination. Improved varieties may be propagated rapidly by using cuttings from the sprouts. Storage. Potatoes require cold storage. 3-4 oC is the optimum storage temperature for seed potatoes. The low temperature prevents sprouting. After harvesting the potatoes are kept for two to three weeks at 15 oC ( a wound healing period) and first then, they are over a one month period gradually cooled down to their storage temperature and they will keep well for a year or so. In spring the seed potatoes are during minimum a fortnight gradually heated to 10 to 15 oC before planting. It may be done by shutting of the cooling system mid March and starting air heating early April for the potatoes to be ready for planting end of April. Potatoes for chips and other food products have to be stored at a higher temperature not below 6-7 oC. That temperature is to high to prevent sprouting and sprout depressing gas has to be used. At 8 oC and below sugars are formed - the colder the more - and the sugar forms a brown color by a Maillard reaction not acceptable in food products. The sugar formation is however not a quantity problem and does not affect starch yield from potatoes used for starch manufacturing and the Maillard reaction is easy to control during starch extraction and refining. Potatoes are sensible to dehydration during storage. They need a near 100% relative humidity or they will dehydrate and shrink. Prolonged storage may take place in layers up to four meters with humid temperate air circulating through the bed. The optimum storage temperatures may depend on variety. There are hundreds of varieties of potatoes. Rich, sandy loams are most suitable for producing the light, mealy types favored by British and American tastes; heavy, moist soils produce the firm type preferred by other Europeans. The most popular varieties in Britain are "King Edwards", "Pentland Crown", and "Maris Piper". Freshly dug potatoes contain 75 per cent water, 18 per cent starch, 1 per cent fiber, 2.2 per cent protein, 1 per cent ash (inorganic constituents), and 0.1 per cent fat and a little sugar. Potatoes grown for starch manufacture may contain as much as 22% starch dry matter. About 75 per cent of the dry weight is carbohydrate. The potato is an important source of starch for the manufacture of adhesives and alcohol. Potatoes also contain many vitamins, including riboflavin, niacin, and vitamin C, and a number of minerals. The most important disease of the potato is late blight (Phytophthora infestans), caused by a fungus that rots leaves, stems, and tubers. It was the late blight which caused the widespread failure of potato crops in Ireland in the 1840s, causing the Irish Famine. The early blight, caused by a different fungus, is not so destructive but causes lesions that permit entry of the various forms of bacterial rot. Several forms of mosaic disease and leaf curl are caused by infection with viruses. The Colorado potato beetle is the most destructive of the insect pests. Potato starch contains one phosphate ester group per 200 to 400 anhydroglucose units which gives a slight anionic character. GMO potatoes may have starch with a higher number of phosphate groups. Industrial Potato Starch Production. Fresh potatoes are carefully cleaned before starch extraction. Soil is removed on rotating bar screens. Adhering impurities are removed by intensive washing with water. High speed raspers opens all cells. The starch granules and juice are separated from cell walls (the pulp) on rotating conical screens using undiluted juice as flushing medium. 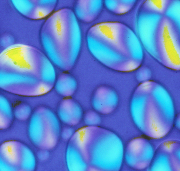 The crude starch milk (starch + juice) is concentrated on hydrocyclones. The concentrated crude starch milk is washed on multi-stage hydrocyclones in countercurrent with water added to the last stage. The resulting purified starch milk has a concentration of 22 B. Most of the water is removed on a rotating vacuum filter and the dewatered filter cake is dried in a stream of hot air in a flash dryer. The dried starch and drying air are separated on cyclones and the starch is cooled in a stream of cold air. The cooled dried starch is screened on cyclone screens ready for storage, packing or bulk delivery. The starch yield in a modern process is close to 96% of the granular starch in the raw material and the ratio of process water to potatoes is typical 1:1 - :1. Scientific classification: Potatoes are produced by plants of the genus Solanum, of the family Solanaceae. 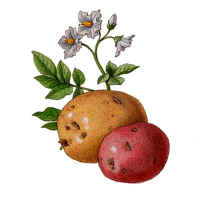 The common white potato is classified as Solanum tuberosum. 20 g h dry substance + 480 g water.